A beautiful meditation on life, love and death or pretentious metaphysical twaddle? 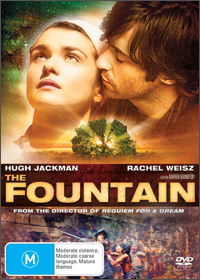 Darren Aronofsky’s The Fountain is essentially both, a formidably complex narrative that positions the viewer to either completely engage with or utterly resist its romantic vision. Over three time periods, each 500 years apart, the story relates a quest for the Tree of Life, with Jackman and Weisz as lovers, variously named Tomas, Tommy and Tom, Isabel and Izzi. In the 16th Century, bearded, brooding Tomas is a Spanish conquistador, dispatched to the New World by Queen Isabel, who is being threatened by the Inquisition. Carving his way through Mayan warriors and a sword wielding priest to a meeting with the Tree, he is unswerving in his devotion to the cause. In a more-or-less contemporary looking 21st Century, Tommy Creo is a scientist whose novelist wife Izzi is dying from a brain tumour. Tommy’s medical experiments on monkeys conjure a miraculous side-effect that he believes may save her, but his zealous pursuit of the cure shortens their remaining time together. The 16th Century episode is now shown to be the plot of Izzy’s novel, yet Aronofsky never depicts these scenes as any less ‘real’ than any of the others. Finally, in the 26th Century, a bald, seemingly Zen-inspired astronaut, Tom – who may or may not be the same man, or simply a recurring, mythical figure – guides, confides in and eats from a giant celestial tree which is travelling towards the far-off nebula Xibalba (conceived as an afterlife by the ancient Mayans), all the while reflecting on his missing soulmate and a date with destiny. Shifting easily between his three time periods with a lyrical wooziness, Aronofsky shoots everything, even the most mundane aspects of the present day, in a seductive anti-realist style. Yet the marvel of the imagery is never matched by the import of his message, that of love challenging death. Or whatever ideas or sensations it is that the director intends to provoke.